McDonald's promises to use only beef, coffee, fish, chicken, and cooking oil obtained from sustainable sources. Coca-Cola promises to achieve water neutrality. Unilever seeks to achieve 100 percent sustainable agricultural sourcing by 2020. Walmart has pledged to become carbon neutral. Big-brand companies seem to be making commitments that go beyond the usual "greenwashing" efforts undertaken largely for public-relations purposes. 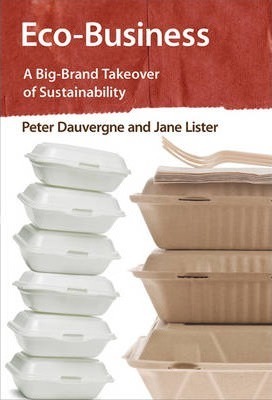 In Eco-Business, Peter Dauvergne and Jane Lister examine this new corporate embrace of sustainability, its actual accomplishments, and the consequences for the environment. Illustrations note 4 b&w illus. Peter Dauvergne is Professor of Political Science and Director of the Liu Institute for Global Issues at the University of British Columbia. He is the author of the award-winning The Shadows of Consumption: Consequences for the Global Environment (MIT Press) and other books. Jane Lister, a Senior Research Fellow at the Liu Institute for Global Issues, is a sustainability practitioner.